Become a member of the Parkway Playhouse Volunteer Guild. Volunteer to usher, bake a cake, cook a casserole, lend a truck or your muscles. However you want to plug in, we would welcome your help. By becoming a member of the Guild you not only make the continued success of Parkway Playhouse and Parkway Playhouse Junior a reality, but you also get great incentives. You can earn a free ticket for every nine hours you volunteer. The biggest bonus is the family you will be joining and the fun and satisfaction you will get working with your new friends. Visit our website at http://www.parkwayplayhouse.com, or send us an email for information on how you can get involved at guild@parkwayplayhouse.com. On Tuesday, March 27 at 6:30pm, Parkway Playhouse will hold its first Usher Orientation. The event is free, and approximately 60 minutes in length and participants will learn about Parkway Playhouse’s season as well as how performances work. Participants who complete the course will be able to sign up as ushers for the 2018 Season and attend performances for free when they are volunteering, as well as acquire additional complimentary tickets to other Parkway Playhouse performances. *Please note that if you were an usher in 2017, you still need to take the class each year to stay up to date. Ushers need to be at least 16 years of age. to a 2018 Parkway Playhouse Mainstage performance. All are encouraged to wear “work clothes” and bring a pair of work gloves. This activity is suitable for kids aged 12 and up. 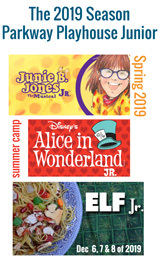 For more information about Parkway Playhouse, including performances, classes, and volunteer opportunities, please call 828-682-4285 or visit the Parkway Playhouse website at parkwayplayhouse.com. Previous Previous post: Madagascar Jr. Summer Camp!